John Gardner Carols composed by John Gardner. For SATB choir accompanied and a cappella (A Gallery Carol: percussion (optional: timpani, xylophone, glockenspiel, triangle, tambourine, snare drum, cymbal), organ; (from vocal score) How bright the morning star does shine: flute (optional), oboe, clarinet (optional), bassoon, horn, trumpet (opti). Mixed Voices. Composer Carol Collections. Christmas, Choral Collection, Sacred. Vocal score. 64 pages. Published by Oxford University Press (OU.9780193388161).ISBN 9780193388161. Christmas, Choral Collection, Sacred. 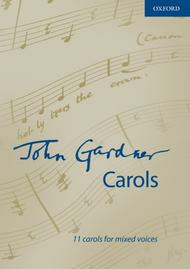 10 x 7 inches.for SATB accompanied and unaccompanied This anthology of eleven carols celebrates the festive music of John Gardner (1917-2011). From the reflective 'A Christmas Hymn' to his joyful setting of 'The holly and the ivy', John Gardner Carols presents a variety of styles and moods that will delight choirs and audiences alike.